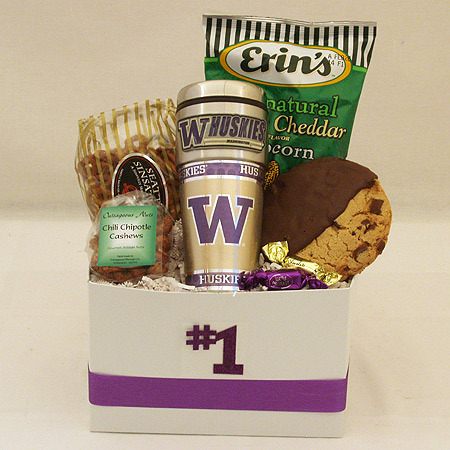 If you’re looking for University of Washington gifts, this Snack Gift Basket with a 16 oz. NCAA Washington Huskies Travel Tumbler is a great one! Packed with yummy Erin’s Cheese Popcorn, Seattle Sinsations Pretzels, Outrageous Offerings Chipotle Cashews, Chocolate Dipped Chocolate Chunk Gourmet Cookie, Seattle Chocolate Truffles and a 16 oz. NCAA Washington Huskies Travel Tumbler with Metallic Wrap and Emblem. #1 as unique gifts for University of Washington fans, students and alumni.